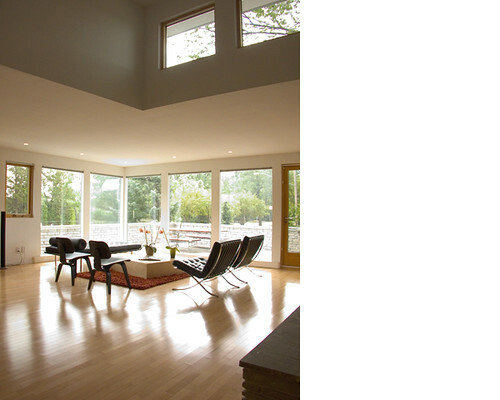 Sited on the west bank of Cedar Lake in Minneapolis, this house evolved out of a consideration for and a direct engagement with the surrounding landscape. A series of low stone walls provide the foundation for the house and emerge from the body of the house to define three courtyards, each with a specific materiality: the eye court (wispy grasses, crab apples and winterberry), the body court (stone pavers), and the mind court (river stones). The eye court provides visual relief from the compressed entry sequence defined by a cantilevered roof plane. The body court allows the inhabitants a physical place to directly engage in outdoor activities, and the mind court offers a spiritual space in which one can contemplate the wonders of nature from a sheltered location.